In recent times, pediatric obesity has become widely prevalent. If first-line treatment with lifestyle modification fails, bariatric surgery may be indicated for severely obese patients. Many patients now travel abroad to get these surgeries done. Some of these patients receive inadequate postoperative care. We described a morbidly obese 17-year-old girl who had a laparoscopic sleeve gastrectomy procedure for weight loss. Due to severe nausea, she stopped her multivitamin supplementation. Within a few weeks, she developed symptoms of dry beriberi was soon followed by classic symptoms of Wernicke's encephalopathy. The prompt diagnosis was made with confirmation from serum thiamine level and brain magnetic resonance imaging. Thiamine supplementation reversed ophthalmological symptoms promptly. However, the patient needed inpatient rehabilitation for neuropathy. This case describes that thiamine deficiency can occur after restrictive bariatric surgery, despite lower risk of malnutrition in the absence of intestinal bypass procedure. This report highlights that in the presence of risk factors: dietary noncompliance, inadequate follow-up, and severe nausea with and without vomiting can precipitate the development of Wernicke's encephalopathy, even after restrictive surgery. Physicians may increasingly encounter thiamine and other nutrient deficiencies in increasing numbers due to increasing prevalence of obesity disorders and availability of bariatric surgeries. This report also emphasized the importance of identifying vague sensory symptoms in thiamine deficiency. Laparoscopic sleeve gastrectomy (LSG) surgeries have become one of the most popular methods of weight loss surgery in morbidly obese population. Rather than a more extensive biliopancreatic diversion - duodenal switch operation, it only eliminates a portion of the stomach, to restrict the amount of food that can be consumed. Moreover, decreased secretion of hormone ghrelin also can decrease hunger. As it does not include intestinal bypass, the risk of malnutrition is significantly less when compared to more traditional bariatric surgeries. It has become very popular, in recent time, with promising result in weight loss, but patients are many times not cautioned about the risk of micronutrient deficiency, as it had been done previously, after more extensive surgery. We described an adolescent who developed peripheral neuropathy and then Wernicke's encephalopathy after LSG to raise awareness of this entity in association with even restrictive bariatric surgery. Neurology was consulted to see a 17-year-old teenager who presented with blurring of vision and altered mental status. Past medical history was significant for her morbid obesity and intermittent headaches. She traveled abroad to undergo a LSG procedure 2 months before her presentation. She did well up to 2 weeks after the postoperative stage, but then developed quite intractable nausea. Around 3 weeks after that, she developed numbness without tingling in her both legs up to the hip. Within 1-week of that, she started to feel weak all over and required assistance during walking. Approximately 2-3 days prior to her presentation, she started to develop a double vision; objects were seen side by side and resolved when she covered either eye. Her double vision was in all gazes, and with both near and far objects. She denied any eye pain, photopsias, brief sparkles or flashes of light, or color vision loss. Mother endorsed that she had noticed her eyes were intermittently crossed and also would jerk intermittently sideways or up and down. At the day of presentation, she started to become more confused, intermittently drowsy, and kept repeating questions to her mother. No significant family history, social history, illicit drug, nicotine or alcohol exposure, and infectious disease exposure was present. She was on metoclopramide and omeprazole for her nausea. She accepted that she had stopped taking her vitamins due to nausea for last several weeks. She was a morbidly obese (weight - 135.4 kg, body mass index - 51.6 kg/m 2 ) girl in no apparent acute distress. She had lost 15 kg since her bariatric surgery. Vital signs were normal. She had a normal systemic examination. She scored 26 (out of 30) points in her Mini-mental State Examination to test her orientation, registration, attention, recall, language, repetition, and ability to follow complex commands. She had bilateral esotropia to suggest bilateral lateral rectus palsy along with very prominent sustained end-gaze nystagmus. She was not very compliant, in participating in detailed sensory and motor examination, but hypoesthesia over bilateral legs up to mid-thigh was seen in nondermatomal pattern; decreased generalized strength with predominant distal muscle involvement was also present. Knee, ankle, and triceps deep tendon reflexes were absent; trace biceps reflexes were appreciated. Plantar reflexes were down going. She could only walk with assistance, and broad-based gait was evident. Emergent intravenous (IV) thiamine supplementation was started with a suspicion of Wernicke's encephalopathy, after drawing blood samples for laboratory testing. Laboratory examination revealed a normal complete blood count, electrolytes, renal, and hepatic functions. Infectious and inflammatory markers were negative. Cerebrospinal fluid revealed opening pressure of 15 cm, 0 leukocytes, 328 erythrocytes, 28 mg/dl protein, and 63 mg/dl glucose. Hemoglobin A1C, thyroid function, lipid profile, serum folic acid, serum Vitamin B12, and 25-OH Vitamin D2 levels were normal. Thiamine level was low at <2 nmol/L (normal, 8-30 nmol/L). Electrocardiogram was normal. 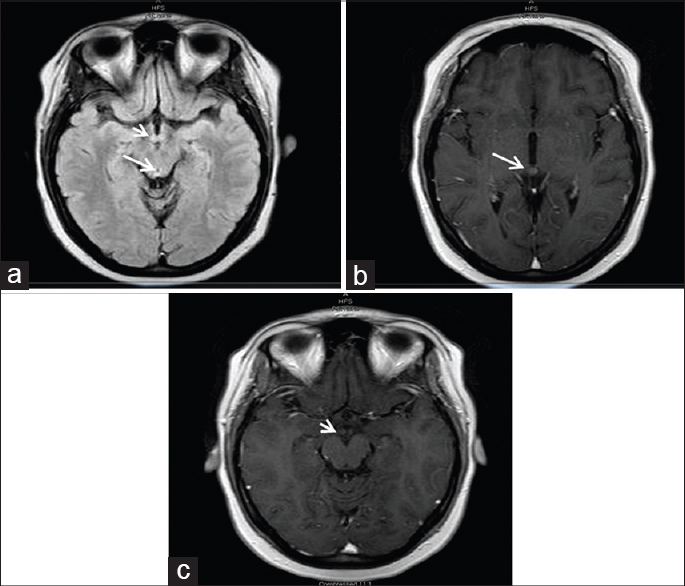 Brain magnetic resonance imaging revealed - abnormal T2 prolongation and restrictive diffusivity of bilateral mammillary bodies and postcontrast enhancement with mild periaqueductal hyperintensity - suggestive of acute Wernicke's encephalopathy [Figure 1]a-c. Nerve conduction studies showed an axonal length-dependent polyneuropathy. IV thiamine supplementation, 500 mg 3 times daily dose, produced a prompt improvement of her ophthalmological finding after two doses. Though her motor strength and balance had also improved, she was required to transfer to inpatient physical therapy rehabilitation for intensive physical and occupational therapy. An increasing prevalence of obesity in the pediatric population has reached an epidemic proportion in recent years. The increase in associated medical comorbidities has produced severe public health impact. Reducing energy intake and increasing energy expenditure (by promoting more physical activity) should be the first line treatment. However, in some patients with severe obesity, pharmacotherapy along with bariatric surgery may be necessary. Now, many patients travel abroad and receive professional, timely, and affordable medical care. Though poor outcomes due to substandard medical care, risk of infection, and acute postoperative complications are some of the concerns, inadequate postoperative care following departure from the treating facility can be the most worrisome trend in medical travel. Compliance to micronutrients after bariatric surgery is of paramount importance, and close monitoring by an experienced clinician can serve several purposes: close follow-up of nutritional status, regular blood work to identify and treat nutritional deficiencies early, earlier identification of vague sensory symptoms, and evaluation with levels of thiamine, copper, Vitamin B12, methylmalonic acid, and homocysteine in suspicion of neuropathy. We want to highlight the possibility of thiamin deficiency even after restrictive gastric surgery, especially in the presence of nausea and dietary noncompliance. Many patients now opt for medical travel for various reasons and do not get their regular follow-up during the postoperative stage. Pediatricians may need to gain adequate experience in diagnosis and management of micronutrient deficiency after bariatric surgery as increasingly, patients may seek advice from primary care providers. This report also emphasized that vague sensory symptoms of beriberi may precede encephalopathy symptoms and prompt, adequate intervention can significantly improve the outcome. Baltasar A, Serra C, Pérez N, Bou R, Bengochea M, Ferri L. Laparoscopic sleeve gastrectomy : a0 multi-purpose bariatric operation. Obes Surg 2005;15:1124-8. Scarano V, Milone M, Di Minno MN, Panariello G, Bertogliatti S, Terracciano M, et al. Late micronutrient deficiency and neurological dysfunction after laparoscopic sleeve gastrectomy : a0 case report. Eur J Clin Nutr 2012;66:645-7. Kirk S, Scott BJ, Daniels SR. Pediatric obesity epidemic : t0 reatment options. J Am Diet Assoc 2005;105 5 Suppl 1:S44-51. Solá E, Morillas C, Garzón S, Ferrer JM, Martín J, Hernández-Mijares A. Rapid onset of Wernicke′s encephalopathy following gastric restrictive surgery. Obes Surg 2003;13:661-2. Jiang W, Gagliardi JP, Raj YP, Silvertooth EJ, Christopher EJ, Krishnan KR. Acute psychotic disorder after gastric bypass surgery : d0 ifferential diagnosis and treatment. Am J Psychiatry 2006;163:15-9. Makarewicz W, Kaska L, Kobiela J, Stefaniak T, Krajewski J, Stankiewicz M, et al. Wernicke′s syndrome after sleeve gastrectomy. Obes Surg 2007;17:704-6. Rindi G, Patrini C, Nauti A, Bellazzi R, Magni P. Three thiamine analogues differently alter thiamine transport and metabolism in nervous tissue : a0 n in vivo kinetic study using rats. Metab Brain Dis 2003;18:245-63. Renthal W, Marin-Valencia I, Evans PA. Thiamine deficiency secondary to anorexia nervosa : a0 n uncommon cause of peripheral neuropathy and Wernicke encephalopathy in adolescence. Pediatr Neurol 2014;51:100-3.